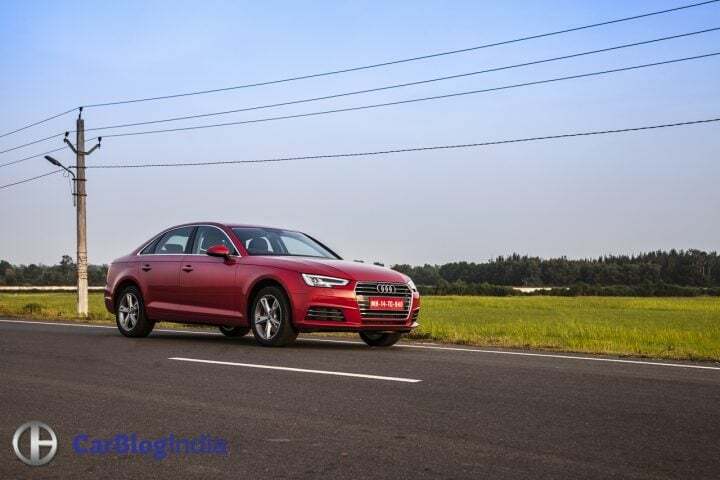 New 2016 Audi A4 Test Drive Review- Sleeker, Slimmer, Sharper! New Audi A4 35 TFSI Review- Sleeker, Slimmer, Sharper! What do you mean ‘what is it’? The Audi A4 doesn’t look like a shrunken A6 or a stretched A3, no, not anymore. True, the design is far from revolutionary, but we certainly appreciate the evolved look. It’s definitely sleeker and looks a lot fresher, but the major chunk of progress has taken place under the skin. 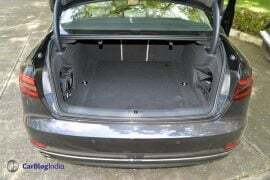 As much as 90 percent of the components are new and the A4 has lost up to 120 KGs. The latest iteration of Audi’s Global best-seller is also sharper around the corners and has a more matured ride. Read on for our new 2016 Audi A4 Test Drive Review. At 4,726 millimeters, the new A4 is 25 millimeters longer than the outgoing version. It’s also 16 millimeters wider (now 1,842 millimeters). 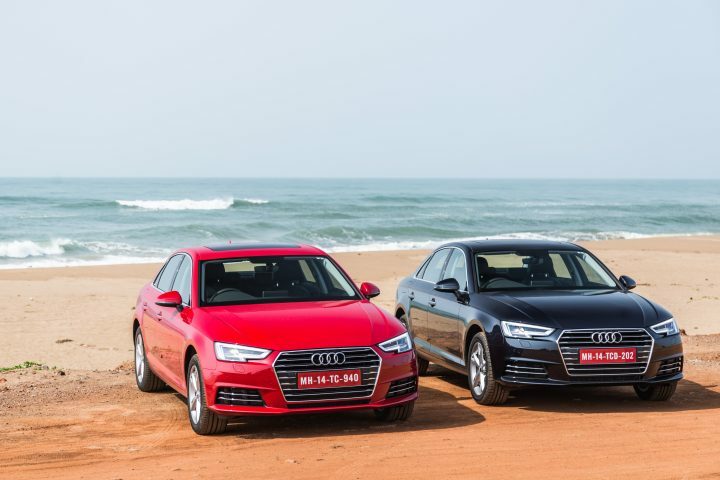 Yet, its height, at 1,427 millimeters, remains unchanged and the new A4 continues to be the lowest in its segment. All this means that the new A4, thanks to its increased width and lowest-in-class height, looks really sporty and now has a more planted stance. The new A4 looks sharper, which is thanks to bits like the Singleframe grille, striking multi-faceted 3D design of the headlights and taillights, and a wrap-around hood. The new-gen A4 Sedan boasts balanced and harmonious proportions. The front fascia is very impressive, much of which is due to the Singleframe grille that has a contoured lattice structure. The wraparound hood emphasizes on the width of this car, thereby giving it a lowered look. The side profile is characterized by flowing lines that go on to give this car a sporty and yet an elongated appearance. The shoulder lines, which begin at the edges of the headlights, go on to wrap around the rear. In the side profile, all the lines together create a rigorous interplay of light and shadows. The wheel arches have a pronounced flare, which makes the design all the more dynamic. The ORVMs are now positioned on the front doors, which is again a design feature that’s reminiscent of many sports cars. The new A4’s trunk lid boasts an integrated spoiler, while the neatly sculpted rear lights further accentuate the sportiness of the design. The new A4’s interior has a particularly impressive design. While it’s a signature Audi interior, highly similar to some new generation Audi cars, it’s undeniably new and feels really fresh. 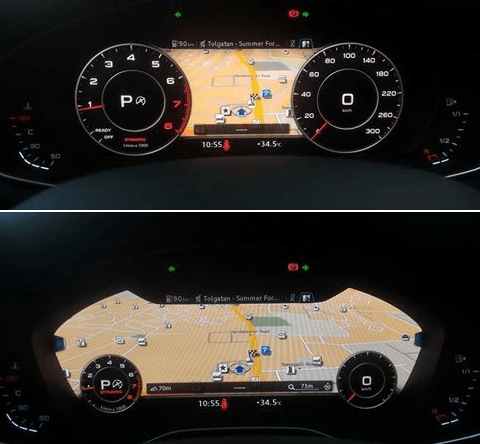 The new dashboard is impressive but the ‘pièce de résistance’ here is the ‘virtual cockpit’ from the TT and the R8. 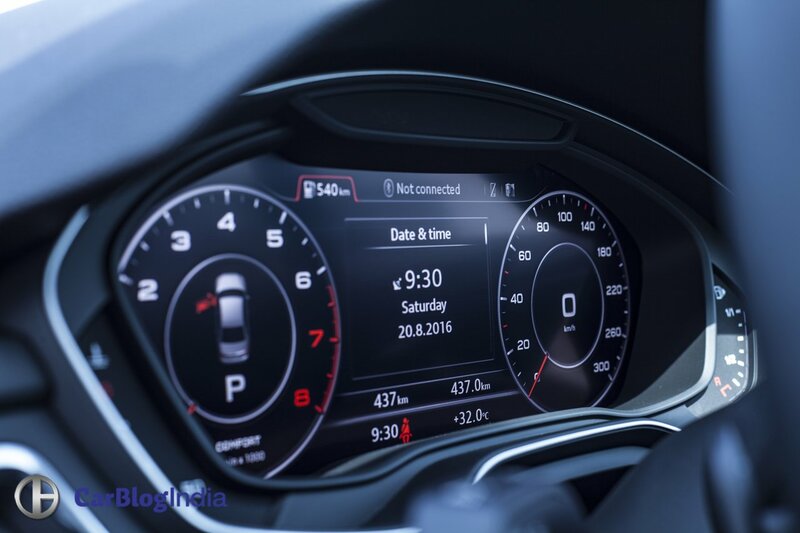 The new-age instrument cluster has a fantastic design and practical layouts. The general controls and the lack of a million different switches aid user friendliness. 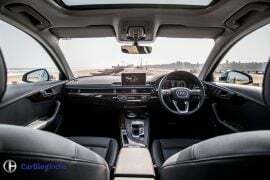 The new A4’s interior looks good and is highly functional, and quite frankly, that’s what really matters. 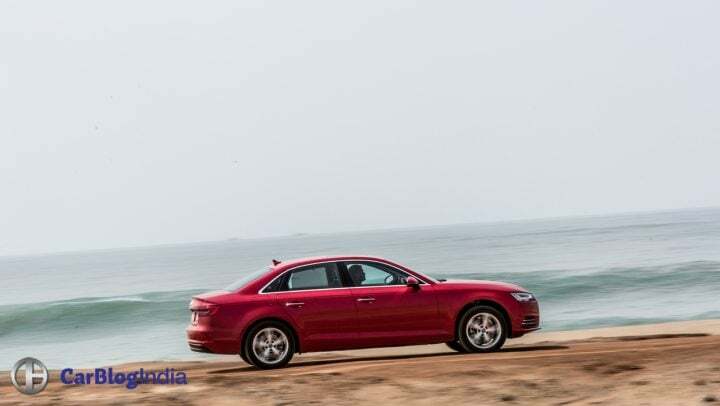 The new A4 will be initially available only with a 1.4-litre turbocharged petrol engine. While this might disappointment many, the new engine, in actuality, feels as powerful as the erstwhile 1.8-litre unit. And guess what, it’s significantly more fuel efficient too! Claimed fuel efficiency, at 17.84 KMPL, is 2.2 KMPL higher than the last-gen A4’s 1.8 TFSI. The new 1.4-litre TFSI unit pumps out a decent 150PS @ 5,000-6,000 RPM and 250Nm @ 1,500-3,500 RPM (20 PS-70 Nm lower). On the go, the A4 feels really sprightly. No, it’s not blazingly quick but the way this car effortlessly builds up speed has us smitten. The new A4, in spite of a lower displacement engine, can hit a double ton without really breaking a sweat. 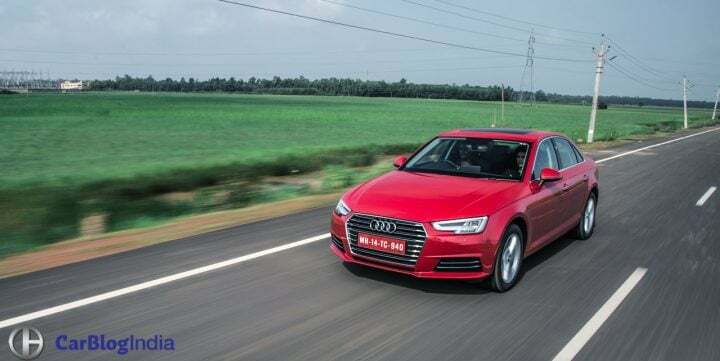 Audi claims the new A4 can dismiss 100 KMPH from standstill in 8.5 seconds, which is just 0.2 seconds more than the outgoing generation. 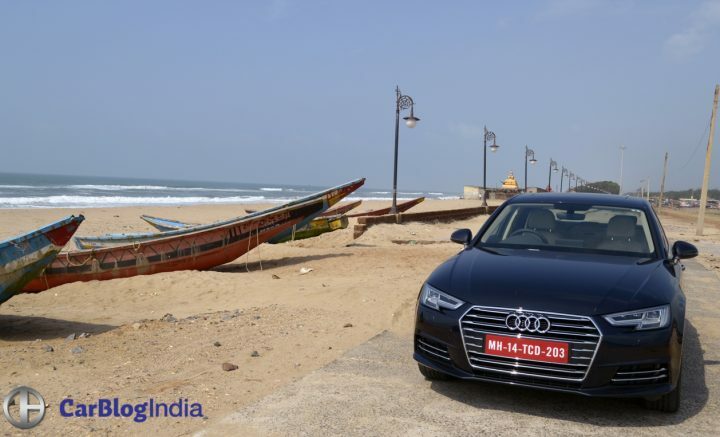 We drove the new A4 on the splendid roads between Bhubhaneshwar and Puri, and the car felt so much at home out on the highway. The 7-speed Dual Clutch Automatic Transmission is as efficient as Swiss clockwork- the shifts are quick, smooth and well timed. The new A4 offers four driving modes- Auto, Custom, Comfort and Dynamic. While the car adjusts the various settings by itself in “Auto”, “Custom” allows you to set the gazillion parameters manually. Comfort mode is where driving the new A4 gets most relaxing. The steering gets really light and the throttle less sharp. The Dynamic mode is the most fun though. It dials in some weight into the steering and the throttle gets really sharp. Also, the gearshifts take place closer to the redline and the exhaust note becomes raspier. There’s also significant improvement in terms of road handling. But what the new 2016 A4 does, and does very well indeed is to offer a really matured ride quality (in all the four modes). Sportscar-like handling characteristics are hardly on wishlists of premium executive sedan buyers. However, you do have cars like the Jaguar XE and the BMW 3 Series for your apex-hunting aspirations. The new Audi A4, mind you, isn’t a dull handler. On the contrary, it’s a definite improvement over the last model. The new A4 offers decent handling manners. The grip levels are high and the steering’s pretty direct. It weighs up pretty well too but the EPS setup ensues low feedback levels. Still, the A4 is now a lot more fun around the corners. Ok, so the new A4 isn’t as fun as the 3’er or the entry-level Jag, but it now deals a lot more effectively with all the bumps and lumps you can throw at it. The latest iteration of the A4 boasts an independent suspension and a 5-link axle at both its ends. This has allowed the Ingolstadt-based carmaker to extract optimum ride comfort. The suspension gobbles up most of the undulations with ease and the new car wafts thru the rough patches in a manner typical of some bigger, more expensive sedans. We even encountered a couple of nasty speed humps, at relatively high speeds, but there’s really nothing that can upset the composure of this car. We’re looking at a ‘magic carpet’ ride here! The A4 now looks fresh and a lot more attractive. The design has definitely evolved in the right direction. 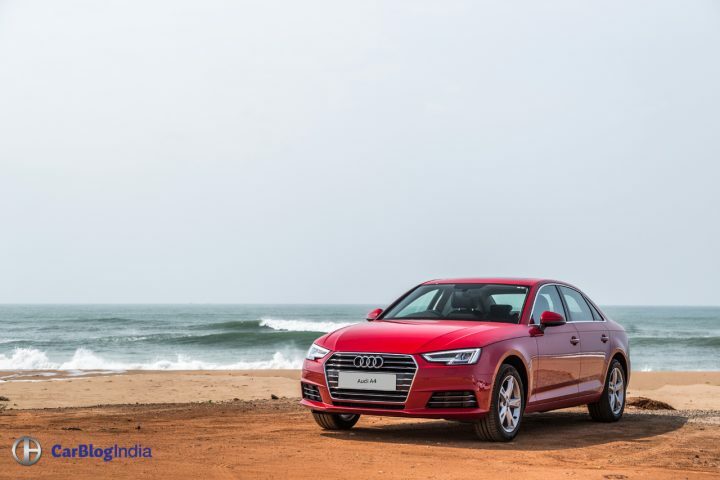 Yes, the new A4 is slightly lower on power and torque, but then, it’s also a lot more fuel efficient in its latest avatar. The cabin, too, is slightly larger and bits like the Virtual Cockpit are much appreciable additions. And then, there’s the magic carpet-like ride, which makes this car supremely comfortable over long rides. The Diesel variant is still a few months away, but you should look no further if a modern, sufficiently sporty and a tech-laden premium executive sedan is what you’re looking for. 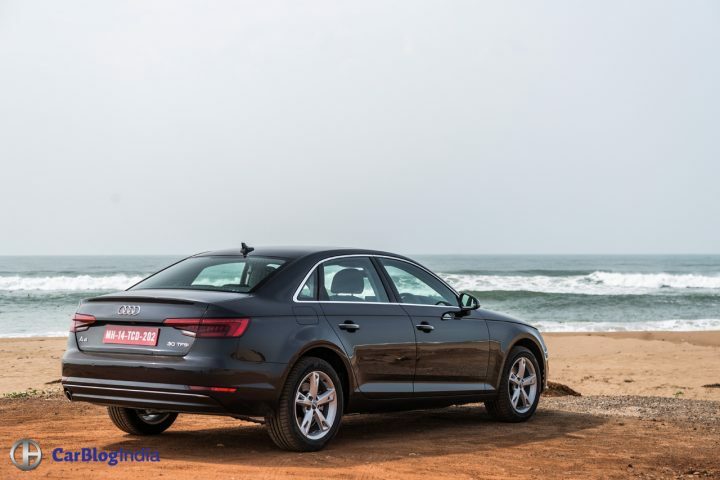 So, what do you say about our new 2016 Audi A4 Test Drive Review? Do let us know by commenting below. 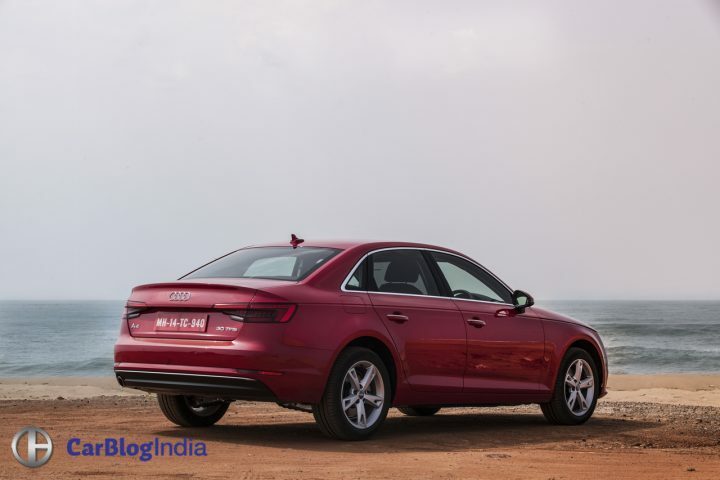 Stay tuned to Car Blog India for more on the new 2016 Audi A4.